If you would like to read more about our philosophy and approach for this study please read our Autistic Approach page. This page will also give you more information on the Sections; including integrated cognitive development. You will have received a Login ID and password for your Observer Account via email, this will also be associated with the child(ren) for whom you have requested participation. If you have not received an email with your Observer login ID and Password please Contact Us for assistance. After you have received your Observer Login ID and Password please login to get started. Observe your student on each task/activity, please try to pay attention to behavior as well as temperament on each task. Provide Feedback after your student completes each section. This is required for your student to continue. Do not make any entries for your student or give the student any answers. You can help guide the student to the correct answer, but we ask that they come to that conclusion themselves. Guide and encourage your student through each task and help when they indicate they need assistance. Remind/help your student to touch or click the microphone icon before speaking. Please feel free to make comments as the stories are playing to enhance learning. For more information please see the Observer tab above. Your student’s work area will have 11 activity sections for separate activity play. The work area also has an icon where they can play all activities as a whole. Your student can click any of the icons to get started. The “Sections 1-11” icon is all sections put together to play at one time. This can be very time consuming to get through (46 questions), so please consider your student’s ability and attention span before guiding them to select sections. For more information please see the Student tab above. You can access your observer area by clicking the Observer button on your child’s page OR by logging in with your Login ID and Password. Data Charts Button-this button will open a new page where you will be able to see all the student performance data collected in detail since you started the study. All data output is only by first name and will be studied by professional in the special education field and other education professionals. You, the Observer will receive the full report when completed. Observer Tips Area-this is where you can see important reminders and tips as you proceed in the study. You can also click the link to get a more detailed explanation on how to proceed with the study. Feedback Area-this is where you will be filling out each survey after your student has completed a section. After your student finishes a section you will see a new survey available. You can click the Take Survey now button to proceed. 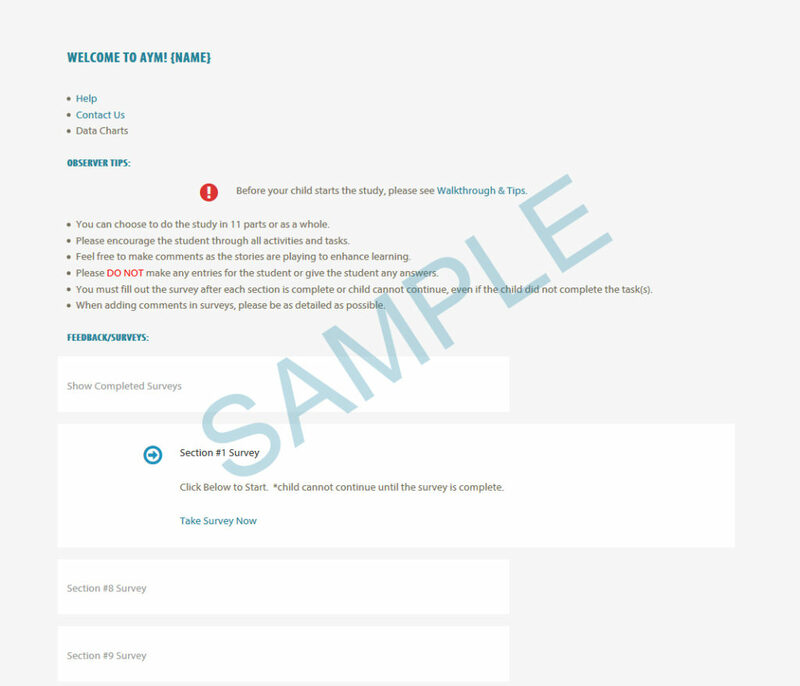 You must take the survey before your student can proceed to the next section. Each percent shows the percentage for the last attempt. This number will change on subsequent attempts. For detailed data click Data Charts button. Indicate the section number. Each Section deals with a different learning test. Spatial Learning, Visual Closure etc. You can see more detailed data on these from your Data Charts button. You do not have to play the sections in order. You can play the sections as many as 7 times. For each section and task/question we ask that you help guide the student through by helping them decide on answers, we strongly suggest that you do not answer the question for the child or tell them the answer. This could skew the data for the study. Thank you for being a participant! Each section has between 1 and 10 questions or tasks. Some tasks have more than one step, please encourage your student through each task. There are a handful of tasks/questions that will ask your student to choose what task they would like to attempt. In those questions, it will ask them to select a button for the task they choose to attempt. If at any point in that task they decide they want to attempt the other task they can select the button during gameplay. They can choose to do both tasks, it will prompt them at the end of those tasks to select if they want to try the other one before the question is over. Replay-the replay button will play the story with videos again. You can click the replay button at any time during the task. Help- the parrot is there to help the student through each section and every question. If you, as the observer, needs help, you can click the Help link on your observer page. If you cannot find the answer you are looking for, please Contact Us. Parrot- your student can click the parrot at any time to repeat the question. A second access/click of the parrot will give the child a little more guidance in some cases, it may give them a hint or take some of the incorrect choices away. Go Button-the go button is there for the child to click (they can also say go) if they do not want to speak or answer a particular question. Timeouts-there is a time limit on each task/question to avoid issues with your student being stuck on an answer. If a timeout happens you will see the task they were on disappear and the next question appears. If your student times out on questions they will have the opportunity to attempt that task/question again in the same round of play. Incorrect Answers-if your student gets an answer wrong, they will have more chances to get the right answer in subsequent attempts and/or multiple chance questions. 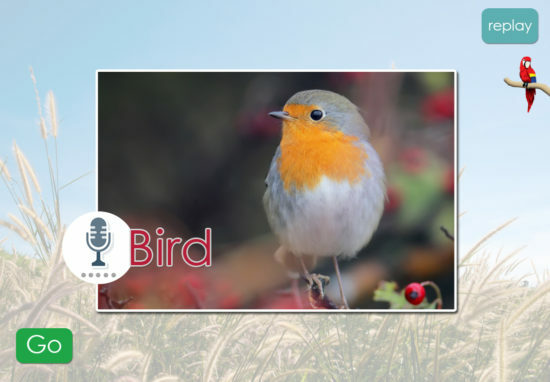 Speaking (Voice Recognition)-your student MUST click the microphone icon before speaking. Please aid then in this task if they need it. All words must be spoken as clearly and correctly as possible. If your student does not say the whole word, but only a partial word or just a sound, that will be recorded. Please encourage them to speak anything they can or want to, we would like to see if gains are being made if they attempt to speak the words multiple times. When the microphone icon appears on the screen, your student MUST click the microphone icon before speaking. If they speak before they click the icon is selected, the system will not detect speech and therefore not record an answer. 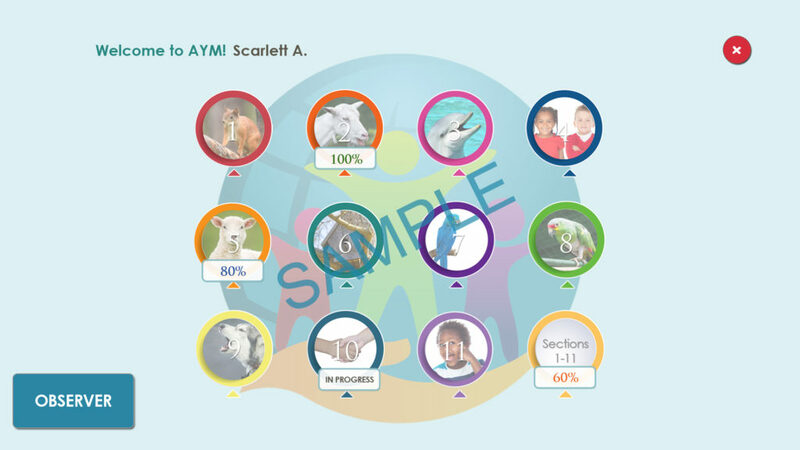 The AYM study can be used on any computer or mobile device that has access to the Internet. For the best experience, you should have a broadband connection to the Internet, such as DSL, cable, or satellite. For a complete walkthrough of the program, please see the Study-Tutorial. You will need to contact us to create an account in order to log in to our site and participate in the Study. Please visit our Contact Us Page if you need us to create an account for you to participate in this Study. Can I do the AYM Study on an Android or iPhone or iPad device? Any tablet or device supports the Study program via a web browser.